El Centro Dos is the second outpost of a popular Mexican restaurant (El Centro) in the South End. It opened in Brookline Village in June. I went there recently to celebrate my friend Leslie's birthday. It was a Tuesday night and the restaurant was almost empty when we arrived at 6:30pm. We started with a pitcher of watermelon sangria ($24). I loved it - the perfect refreshing summer drink. 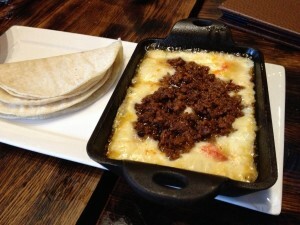 The queso fundido was served in a hot cast iron pan which kept the cheese fondue bubbling and seared the cheese on the bottom. We opted to have it topped with crumbled chorizo sausage and scooped it up with floppy tortillas for a perfect cheesy-meaty bite. 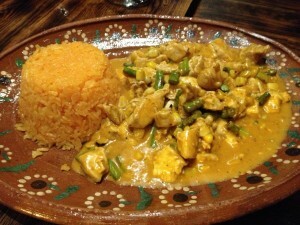 Pollo Al Chipotle ($15)- chicken in chipotle sauce, served with sauteed asparagus, corn and rice. The sauce had a nice kick and we discovered that this was even better eaten as a dip with the chips. 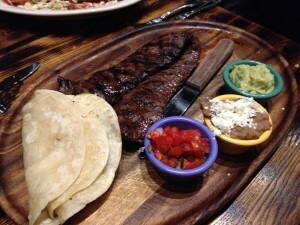 La Mejor Del Mundo ($22)- charcoal grilled steak Sonora style served with refried beans, guacamole and bandera sauce. This was my favorite dish of the night. The steak was really tender and flavorful and the portion was generous. Chimichanga ($15) - Mexican-style flour wrap stuffed with a choice of shredded beef, charcoal grilled steak, marinated pork, or chicken, then pan fried and immersed in salsa narciso romero. - We opted for shredded beef and this was another favorite of mine - great flavors and texture. 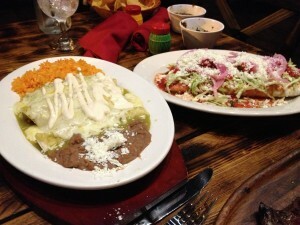 Enchiladas ($16) enchiladas in green, red or poblana sauce topped with melted cheese, choice of: chicken or beef. We had chicken with the green sauce. It was a perfectly good, basic rendition of enchiladas, but nothing special. We had churros for dessert. They were under cooked but that meant the inside was custardy in texture, so it almost worked in their favor. It came with a caramel chocolate dipping sauce. The service had a few snafus - my friend Sonia asked for hot water with lemon and got tepid water with nothing. It also took a very long time to get the check, which is baffling, as there was never more than 2 other tables occupied during the evening. But, the waitress kept us stocked in chips and spicy salsa (which is very important in any Mexican restaurant) and was friendly. I think the prices are quite affordable, the portions are huge and the watermelon sangria may be my favorite drink of the summer. I hope they do more business during the weekends; otherwise this place is in trouble.